More shots for LeBron? Be careful what you wish for, King. LeBron James, the guy with two championships rings, this week said he’s "jealous" of how many shots Oklahoma City Thunder star Kevin Durant takes. It should be noted that Durant — again forced to drag OKC to victory without Russell Westbrook — recently said he’s shooting too much. 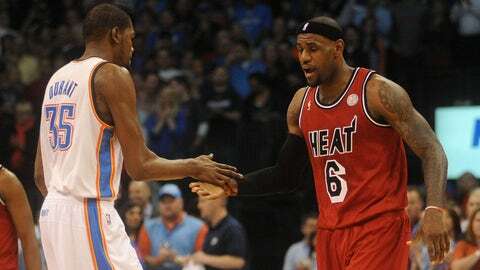 Simply put, KD has room to improve as a facilitator; LeBron has been great in this capacity his entire basketball life. "I’m not much of a forced-shots guy," James said. By the way, with OKC playing at a faster tempo, Durant is squeezing off 30 percent of the Thunder’s attempts. Miami takes fewer shots, and James’ share of those is 28 percent. For the record, Durant is shooting 49 percent from the field, while LeBron — who averages 16 shots per game — is connecting on a gaudy 59 percent. "If I get up high 20s, 30 shots a game, what could I do today with the way I’m playing?" If he took 10-12 more shots per game, LeBron — who fired up 30 or more shots 22 times while playing without All-Star teammates in Cleveland — probably would do a lot closer to 49 percent. Aside from visiting nearby Akron or taking on the Cavaliers as a star of the Miami Heat, we have two words to begin our response to this particular question … heck and no. Although it’s been assumed LeBron will be intrigued with the possibility of playing alongside Kyrie Irving, The King’s strengths as a playmaker would be reduced by the existence of another dominant ballhandler. And if you think Dwyane Wade qualifies as such, he’s demonstrated a willingness and ability to play off the ball; that’s something Irving (a lifelong PG) has yet to attempt. Sure, the Cavaliers have considerable young talent amassed through failure on the court and triumph at the draft lottery. Unfortunately, not all of their selections seem prudent at this point, and those players that have demonstrated some NBA aptitude will be difficult to afford down the road with James on the payroll. Are the Cavaliers ready to fire Mike Brown after one season? Based on how much more efficient LeBron has been in the system of Miami Heat coach Erik Spoelstra, it’s hard to imagine him volunteering to play for Brown again. 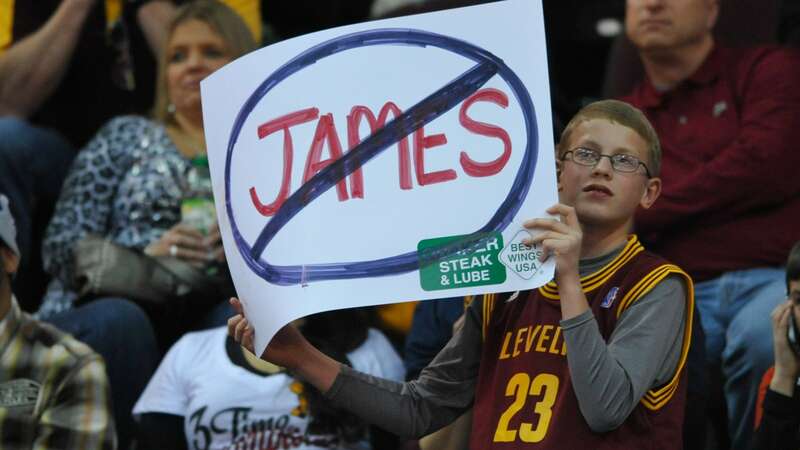 We’re also not sure if LeBron and owner Dan Gilbert can muster a sufficient reconciliation to make this happen. Well, it’s obvious that, with the return from injury of Rajon Rondo, Boston and first-year coach Brad Stevens will have one of the league’s most perceptive players. And they’ll have a true facilitator running an offense that currently ranks 24th on the NBA’s efficiency list. Although exactly what the Cs receive from Rondo depends on how well he’s recovered from the ACL tear, his savvy should make offensive life much easier for Jeff Green, Jared Sullinger and rookie Kelly Olynyk. Unfortunately, these players don’t exactly solicit as much defensive attention as the Boston stars they’re attempting to replace as go-to scorers. Based on the opposition’s historical dismissal of Rondo’s shooting stroke, this could make it a bit more difficult for the point guard to take the ball wherever he wants it to go. 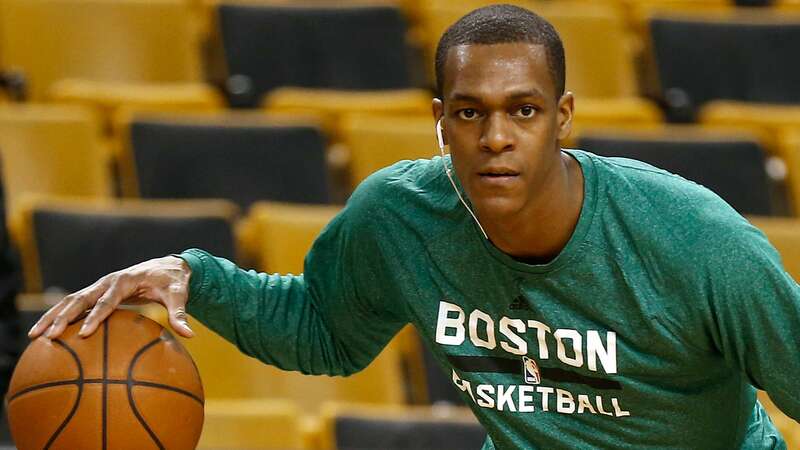 But Rondo is still one of the league’s smartest players; he’ll figure out ways to create opportunities. His presence also enables Stevens to lean as much on screen-roll schemes as he did while coaching at Butler. On defense, any questions about his ability to move laterally could be temporarily eased by having teammate Avery Bradley continue his work against opposing point guards. It might be easier for Rondo to battle attempted two-guard post-ups than to chase guys around ball screens. We recommend watching out for those Memphis Grizzlies. Checking in at an unremarkable 19-19, last season’s Western Conference finalists could be starting to perk. The biggest (literally and figuratively) reason for Memphis optimism is the return of center Marc Gasol. 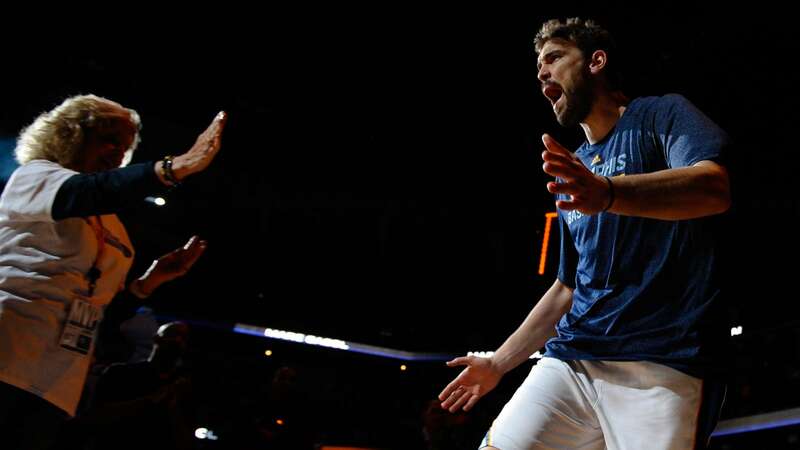 With Pau’s younger brother in the lineup Tuesday night, the Grizzlies took down the Oklahoma City Thunder. Shortly after Gasol left the lineup (ACL sprain) early this season, Memphis lost seven of eight games. They were 10-13 overall while he was out of uniform. Gasol, last season’s Defensive Player of the Year, was averaging 16 points and 7 rebounds when he was injured Nov. 22. Another upgrade in Memphis (on the floor, if not the payroll) is the addition of shooting guard Courtney Lee. Since moving Jerryd Bayless to Boston for Lee, the sixth-year pro has provided some offensive punch to go with his solid defensive chops. In his first four games with the Grizz, Lee scored 59 points, including 24 against OKC and 15 vs. Atlanta. He knocked in 23 of 43 shots from the field and contributed 14 rebounds. Based on recent reports driven by input from NBA talent evaluators, "up" is not a word we’d associate with the fluid draft status of Kansas freshman Andrew Wiggins. 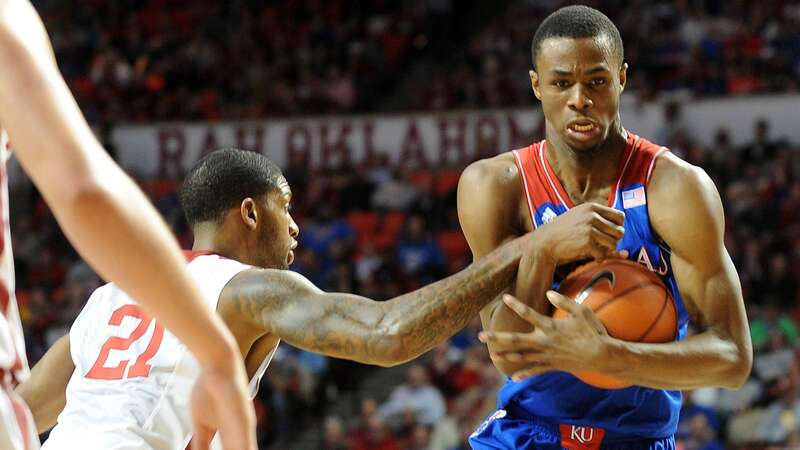 The hot name (one that was referenced in this space several weeks ago) is Joel Embiid, another Jayhawks’ freshman now considered a strong candidate for the overall No. 1 selection. And with Duke freshman Jabari Parker going through a mini shooting-efficiency swoon, the Embiid bandwagon should continue picking up passengers. Even though concerns regarding Wiggins’ motor, perimeter stroke and limited handle are valid, perhaps this recent spate of criticism will provide a motivational spark. While it’s true that many superstars (in any discipline or field) are self-motivated, we also should acknowledge Andrew is still a kid and never did solicit the spotlight or the presumptions of superstardom. He does, however, have elite physical tools. He wouldn’t be the first prospect to produce a rise in intensity as his maturity kicks in. Not going first overall shouldn’t be considered failure or a prelude to professional doom.